Kids love walkie-talkies. They are perfect for playing spy games and for keeping in touch with friends while running around the neighborhood. They also provide you with another way that you can stay in contact with your kids. When it’s time for dinner, just call them back to the house on their walkie-talkies. But shopping for walkie talkies for kids isn’t easy. Some models are simply too complicated for kids to use—and many are also a bit too expensive. Thankfully there are a few choices out there which are ideal. Looking for kids’ walkie talkies, but not sure where to start? Check out top models in the comparison below. Still not positive way you need to look for in kids’ walkie talkies? Read on to learn everything you need to know to make the best purchase. What are Kids’ Walkie Talkies? Technically, “kids’ walkie talkies” are any walkie talkies which are used by children. Cheap walkie-talkies which are designed specifically for children. These are toys and are typically sold in toy stores. 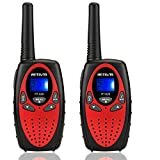 Actual walkie talkies which anyone can use. These are designed for adults, but kids love them too. It is recommended that you avoid the cheap toy walkie talkies. They typically get almost nothing in terms of range (often they are limited to 20 feet or less), and they break at the slightest provocation. Furthermore, they provide only limited use. You cannot for example make any serious use of them on a family trip. If you buy your kids real walkie talkies, they will provide a much better range and will stand up to wear and tear. As a bonus, the entire family can use them. 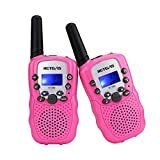 If you are shopping for walkie talkies for children who are five years old, that is much different than shopping for children who are ten or eleven. If you are buying these for younger children, it is extra important to make sure that they are very easy to use. Older children will have a much easier time learning about advanced features (and may enjoy doing so). Young children however really just need the basics. What kind of environment do you live in? If you live out in the country, you will have a much easier time getting range on walkie talkies than you would in the suburbs or the city. So if you do live in an environment like the city where there are a lot of obstructions, you need to shop for a walkie talkie set with a longer range. You might consider aftermarket antennas to extend that range as well. Will you also be using the walkie talkies? You can justify spending a bit more money on a set of walkie talkies for your kids if you will also occasionally be using them. You may also want to shop for more advanced features if so. Walkie talkies are very handy when you are on vacation, and you will doubtless find other uses for them as well. This is especially important when shopping for walkie talkies for young children. Large buttons and simple, clear functionality are what you are in the market for—not complicated features. Check user reviews to see how intuitive the walkie talkies are before you buy them. A long range is important in walkie talkies, but you need to be aware of how range on walkie talkies plays out in real life before you go shopping. Many walkie talkies advertise “up to 30 miles of range.” The key words here are “up to.” When the packaging on a set of walkie talkies makes a claim like this, it only applies to a completely unobstructed area like a totally flat field. In most environments, you should be happy if you get two miles of range. Of course, your kids probably do not need more than that since they will be playing in the local neighborhood. Just keep in mind that walkie talkies which list a shorter range (15 miles for example) may be unusable in certain city environments which are heavily obstructed. Kids are usually not all too careful when they are playing. Their walkie talkies will be dropped in puddles and mud and used in rain and shine. So consider shopping for a set which includes at least some basic weatherproofing. Children can be quite rough when playing, and their walkie talkies are probably going to be subjected to all kinds of abuse. They may be dropped on sidewalks and other hard surfaces. Buy walkie talkies with a rugged design which can hold up to all that wear and tear. During the summertime, just think how much use these walkie talkies will be getting. Shop for models which offer a long battery life. This is helpful for your kids and for you. Finally, there are a host of other handy features which are great to look for when you are shopping for walkie talkies for your kids. Obviously your children do not need the most advanced state-of-the-art two-way radios, but a few features are nice to have and are more or less standard. A call tone is useful as it sounds out to alert your kids when they call each other. Auto-squelch helps to reduce the static which interferes with clear transmissions. VOX is a hands-free feature, excellent for children who are running around playing and who may not want to actually push buttons every time they need to talk. Now you know what features are most important to look for when you are shopping for kids’ walkie talkies. 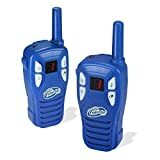 If you are ready to find the perfect walkie talkies for your children, scroll back up to our comparison chart at the top of the page! If you are searching for functional FRS two-way radios which were designed for children, then the Little Pretender set fits the bill. These radios are compact, easy to learn how to operate, and offer a surprisingly good range considering they were built for play. Range up to 2 miles. This is pretty impressive for toy radios. They should work great in and around the house. 3 channels available. This is a useful privacy feature for kids who are playing games. For example, with a game involving two opposing teams, it is possible to set up separate team channels. Bright LCD display. Small children will find the bright LCD display easy to read. Compact but durable. Kids’ hands are small, and as a result, they may find adult-sized walkie talkies hard to use. These units are small, ergonomic, and comfortable. They are also rugged enough to stand up to the kind of abuse that kids are likely to subject them to. Easy to use. The learning curve with the Little Pretender set is not too steep. Even small kids can pick up on how to use these fairly fast. Built-in flashlight and belt clip included. These walkie talkies would be pretty cool even if they included nothing more than the most basic features. But they do have some nifty extras which make them even more exciting for children. There are quality control issues. Some units stop working after a short period of time. Most however deliver great performance over the long term. 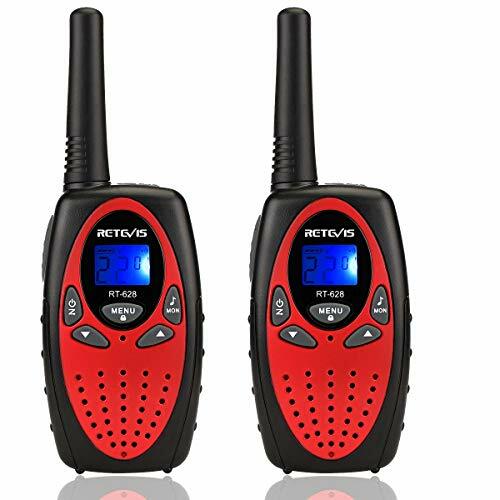 Retevis RT628 walkie-talkies are small, lightweight, and affordable, and designed with children in mind. Far from mere toys, these are fully functional communication devices, making them a fun and educational gift. Nonetheless, they are built to be easy to use so that even young kids can grasp the basics without too much trouble. Compact and lightweight. These handheld units are small and lightweight so that they can be carried around with ease even by tiny hands. There is also a belt hook so that kids can run around with them without dropping or losing them. Easy talk feature. Even with powerful functionality, ease-of-use is forefront in the design with a large, simple talk button. Range is impressive. The range is not specified on the seller’s page, but users confirm that it is significant. Lots of channels. 22 FRS and GMRS channels. Hands-free operation. VOX for hands-free operation lets children hook their walkie-talkies to their belts and simply speak to operate them. This means they are less likely to drop them while they are playing, and they can enjoy more active outdoor games. Back-lit screen. Kids can play with their walkie-talkies after nightfall with the aid of a back-lit screen. High and low power settings. It is possible to adjust power upward to boost transmission range, or downward to conserve battery. Cool design. The fun, colorful design is one that kids will love. The batteries can run out quickly and regularly need to be replaced. Some customers received non-working units (perhaps damaged in shipping). Thankfully these buyers were in a clear minority. The Sokos Walkie Talkie set for kids is designed to offer children a simple, easy-to-use product which contains all the functionality of grown-up walkie talkies. These mini handheld devices come in bright, fun colors, and are surprisingly sturdy. Rugged build. Buyers mentioned that these are very sturdy and do not look or feel like toys. Even though they are inexpensive and designed for children, they are built to last. Crystal clear audio. Thanks to auto squelch, these walkie talkies transmit crisp audio. Easy for young children to use. There is a learning curve with these, but it is not too steep, and most kids should pick up the basics of operation pretty fast. Compact design for small hands. 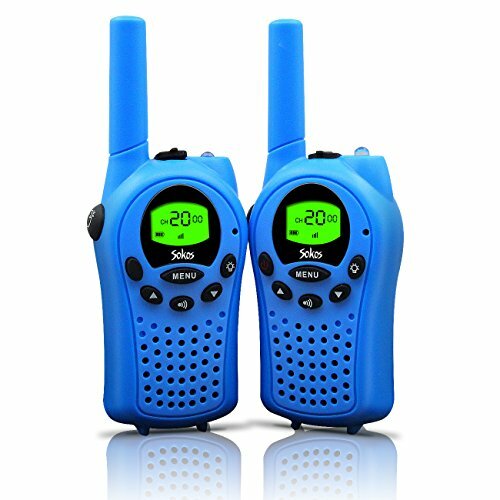 Unlike standard walkie talkies, these Sokos units are designed with a small profile so that young children can hold them and push the buttons without needing to use both hands. Long battery life. You get up to 3.5 hours of continuous operation on a single charge, or up to 9 hours on standby mode. Numerous other great features. There are quite a few excellent features which add to the functionality of these two-way radios. These include channel lock, channel scan, low battery alert, and even a built-in flashlight. There may be some issues involving quality control. A few buyers said their walkie talkies did not last long. This is a very small minority however, and there do not seem to be any consistent complaints. 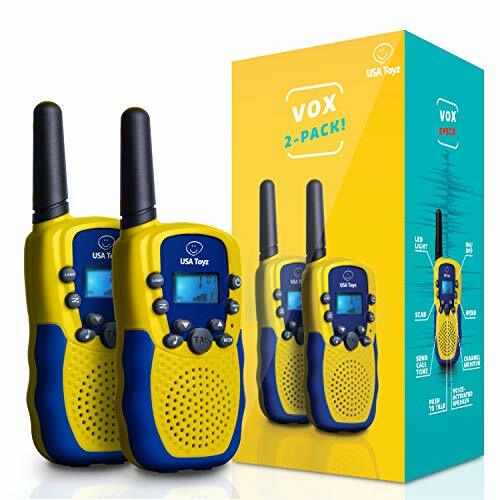 The Vox Box walkie talkie set from USA Toys is a set of real, working walkie talkies designed with young users in mind. Ease-of-use features make the set accessible even for small children, but the functionality of the radios makes them useful for kids and adults alike. The range is actually quite good. The walkie talkies are advertised to offer “3+ miles of range.” As is typical with two-way radios, this is an exaggeration in normal conditions. Nonetheless, the effective range can be over a mile in some environments. That is actually competitive with a lot of fully featured walkie talkies built for adult users. Easy user interface. Even small kids should have no difficulty with the clearly labelled buttons. The large LCD screen displays information in a simple, intuitive way. Flashlight included. This is a feature which is great for both fun and safety reasons. Plenty of channels. With these two-way radios, kids have access to 22 different channels. 99 sub-channels mean that kids will have no problem finding private channels on which to speak or play. Voice activation. It is possible to transmit on the Vox Box two-way radio set simply by speaking. This means that kids can keep their hands free for play. Educational. 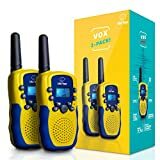 Because these are functional radios, they are a great starter set for kids before transitioning to more sophisticated sets. Their functionality also makes them great for the entire family to stay in contact in the neighbourhood or on vacation. Battery life can be iffy with these walkie talkies. Some units seem to eat up batteries within a matter of days, even if the radios are not in use. Thankfully most units do not seem to have this problem. How Can You Call for Emergency Assistance on the Water?